A train in the town of Acultzingo, Mexico, considered the train robbery capital of the world. You might’ve thought train robberies were a thing of the past, a relic of the Wild West, but that’s not the case in the Mexican town of Acultzingo, which is now considered the Train Robbery Capital of the World, according to Bloomberg. And it turns out, Mazda’s taking quite a blow financially as a result. Located about four hours southeast of Mexico City, Acultzingo is an impoverished community where most residents “work the land for the living,” Bloomberg reports. Some grow vegetables, others raise cattle, and some have taken to literally robbing trains. Over the past year alone, there were 521 crimes committed against cargo trains in the town. And a chunk of those incidents bore no resemblance to the run-of-the-mill petty crime seen in the bigger cities of northern Mexico — vandalizing a train car or stealing railway signs. No, these were massive, choreographed affairs that often started with a low-tech trick that dates back to the days of the Wild West — piling rocks up high on the tracks — and involved small armies of thieves who descended on the derailed cars in waves to cart off the loot. Bloomberg says there’s no limit to what goods are purloined. The robbers have taken tequila, shoes, toilet paper, tires. They’ve also rankled Mazda Motor’s offices in Mexico City. Once the stolen fuel market went kaput, the robbers moved onto trains. 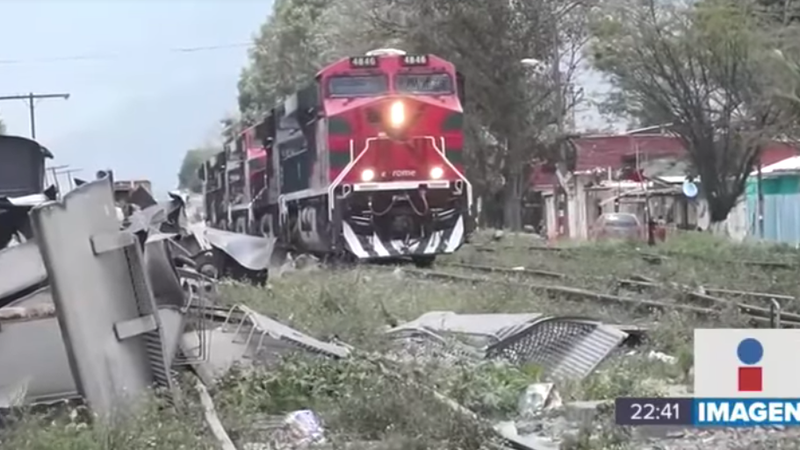 Train robbers in Veracruz came up with a new way yesterday of halting a freight train to steal its contents. They pulled up part of the track. The subsequent derailment occurred early yesterday morning in Acultzingo, sending four cars and the locomotive off the rails. All five were damaged but there were no injuries. Others sabotage the brakes, Bloomberg says, causing pileups and injuries. And when a train derails, locals from the town come in and take the goods. It’s becoming a growing headache for the auto industry, too, reports Bloomberg. The head of the country’s auto industry association described the situaiton as untenable, Bloomberg says, and Audi said the thefts have had a “big impact” on its distribution in Veracruz, where the thefts take place. “Every car we make has a client waiting for it,” Audi reportedly said. The business issues aside, Alejandro Schtulmann, a political risk analyst, told Bloomberg why it’s easy to get locals to get involved when a train is derailed. He pointed to the growing trend of income inequality.